Pan sauteed asparagus with balsamic vinegar is a super easy and quick side dish idea. The spring asparagus season is upon us, so let’s enjoy it! My former boss was an Italian at the Gelateria ice cream store where I worked as a teen. He used to cook lunch for us and it was always special. Most of his authentic Italian meals were cooked within an hour and many even in less then 20 minutes. He used to prepare these pan sauteed asparagus with balsamic vinegar and he would serve the stovetop asparagus with homemade potato gnocchi (which he would cook one day in masses and freeze) and a creamy bacon gnocchi sauce. I use green baby asparagus to successfully cook this Italian asparagus dish in a skillet because the young ones are more tender and cook through quickly. Try to pick only young fresh looking, crisp Asparagus in your local grocery store. Green asparagus sauteed in olive oil, in my opinion, look better when served. Besides green asparagus only need to be trimmed and not peeled like the white ones (except if the skin is also tough and fibrous). White asparagus are always trimmed and peeled. 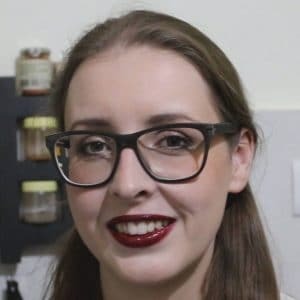 How to sautee asparagus in a pan? The easiest and quickest way to cook asparagus is cooking asparagus in a skillet. Pan-fried Asparagus are really quick easy to prepare, this is because you don’t need to parboil the fresh asparagus. That way you save time and effort and the balsamic vinegar adds plenty of flavors to the side dish. So you won’t have to compromise on flavors here! To prep the fresh asparagus, make sure that they are washed and that you pat them dry, or else the excess water will splash in the pan. Trim the woody, tough fibrous asparagus ends off. To cook, heat up a pan with olive oil and place your asparagus into the pan. Drizzle the Balsamic vinegar over the asparagus and season with black pepper. Cook your asparagus for about 5 minutes on medium heat or until you feel they are done. Shake the pan occasionallyduring the cooking process. Don’t overcook the skillet asparagus, or they will turn lifeless and soggy ugly. 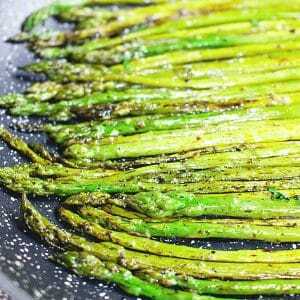 How to serve the sauteed asparagus recipe? I always sprinkle lemon over my sauteed asparagus before I serve them up. Serve these perfect asparagus with a seafood, vegetarian or meat dish of your choice. The pan asparagus pairs really well with rice, orzo and other veggie side dishes. 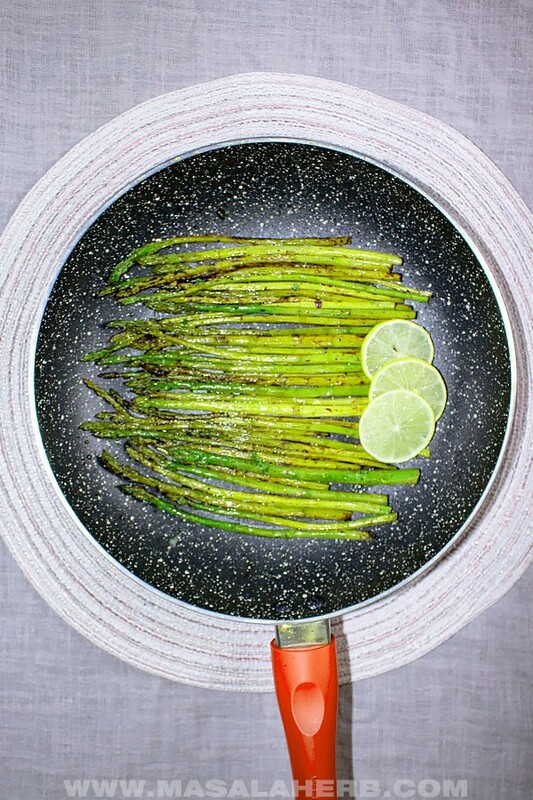 Bright pan sauteed asparagus with balsamic vinegar. 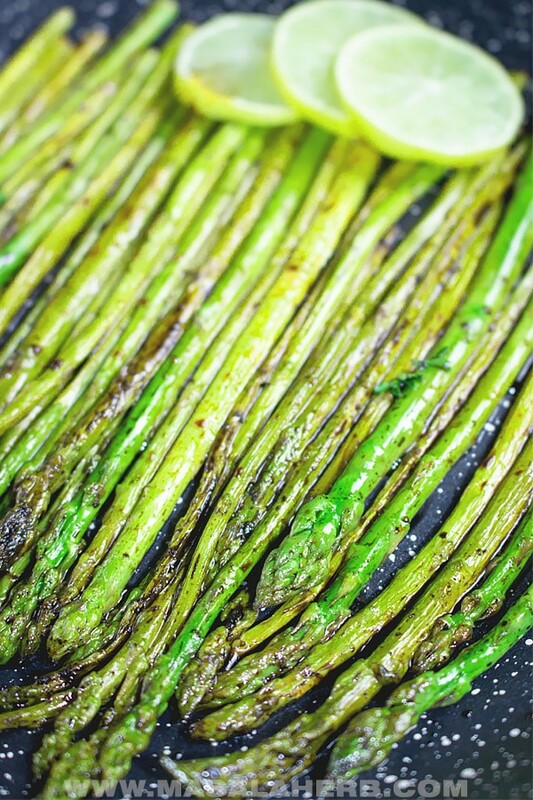 This easy asparagus side dish is flavorful and ready within minutes. Let’s celebrate the asparagus season in spring! Wash your asparagus spears to get rid of trapped dirt. Pat them dry or else the water will jump in the pan during the cooking process. Trim off the tough woody and fibrous asparagus ends. Heat up a skillet and keep on medium heat with the olive oil and place your asparagus into the pan. Sautee your asparagus for about 5 minutes or until they are cooked. Shake the pan occasionally. The asparagus should still have some texture and should not be soggy and lifeless. Drizzle Lemon Juice over the asparagus just before serving them still hot. 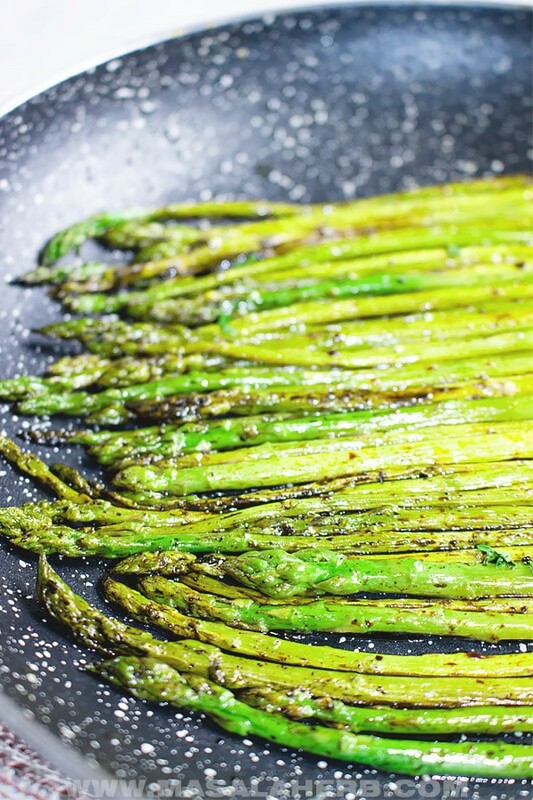 Dear Reader, with what are you planning to serve these balsamic pan sauteed asparagus? I’ve already begun to see the spring asparagus at the markets, but not Ontario asparagus. Once they come in, we will be eating asparagus all the time. I like to sauté them in butter, it just makes them taste so good. What a lovely boss you had, that he made lunch for you every day. Ha yeah! Italians make great food. Hi, this may be interesting you: Pan Sauteed Asparagus with Balsamic Vinegar!